// Create facebook object for user login. return $output; // Returns a result. $output['facebookurl'] = $facebook->getLoginUrl($facebook_params); // Returns the facebook login url as result. Here is my php code for facebook login. Certain event will call the facebook_login() function and will do some processing based on the $output result. The problem is $facebook_user is always 0, i.e. I always get the getLoginUrl as output. I have tried all the answers in on stackoverflow related to this issue, but none helped me. I am testing this app on my localhost and have set the Site URL to http://localhost/mywebsite in facebook app settings. When you are running this code, are you logged into facebook and following the login URL? You The User ID will only be returned if the App has been added by the user and the cookie has been set on your site. 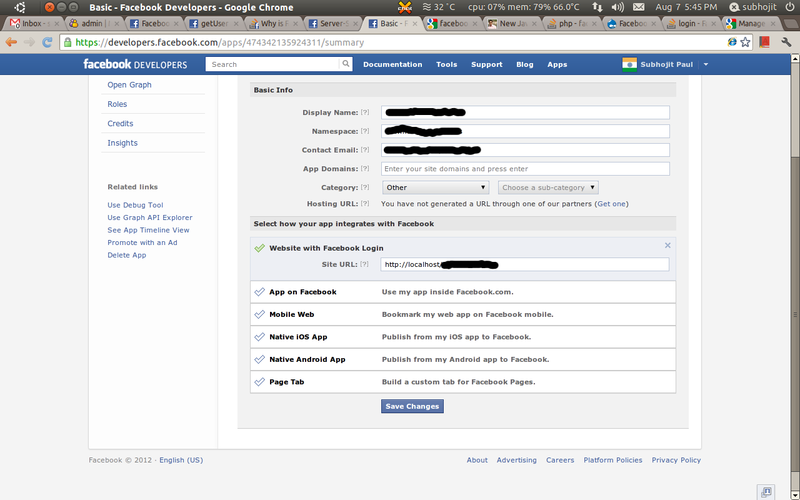 Running this on Localhost will work fine as long as your app settings on FB are configured to point to localhost too. Not the answer you're looking for? Browse other questions tagged php facebook facebook-graph-api drupal-7 or ask your own question.